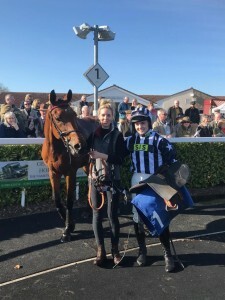 Deauville Dancer made the long journey to Wincanton on Monday (25th March 2019) a very worthwhile one as he landed the South West Racing Club Handicap Chase clocking up his 7th victory over fences within the last two seasons. Ridden by jockey Jonjo O’Neill Jr. for owners Mr G. Brandrick & Partner, Deauville Dancer was always in the thick of the race before being sent about his business by O’Neill from three fences out. There was a ding-dong battle up the home straight between Deauville Dancer & eventual runner-up Opening Batsman before the 8yo son of Tamayuz gained a narrow advantage over the last fence & ran on well all the way to the line to land the spoils by just under 2 lengths. 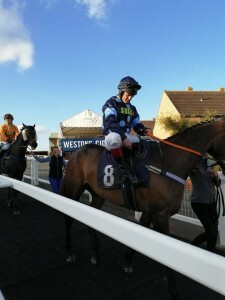 This was a long awaited victory for the David Dennis Racing team following a quiet winter winners wise & it seemed fitting that it should be Deauville Dancer that ended that spell having it been him that gave us our last winner back in November when he won at Kempton. Deauville Dancer is an excellent jumper of a chase fence who loves top of the ground & hopefully he should be able to find further opportunities later this spring. Deauville Dancer’s victory is hopefully a sign of a change of luck as the horses are all running better with a 2nd placing from Make Good earlier in March (he runs again today 27th March in the 4.40 at Lingfield) & with all three runners the following day being placed in the first two at Hereford on Tuesday 27th March. Veiled Secret & Brunel Woods both contested the Happy Retirement Noel Fehily Handicap Hurdle (2.00) at Hereford on Tuesday & both horses returned back into the paddock with 2nd & 4th placings. Brunel Woods ran with lots of promise to finish 4th for his owners The Dobbin Club & Favourites Racing 7 & there is sure to be more to come from him over the spring & summer months. Meanwhile Veiled Secret ran a much improved race to finish 2nd in that same race for owners Clan McNeil running all the way to the line to just be touched off by 1/2 a length. Marquis Of Carabas was our third runner that day in the St Michael’s Hospice charity race & ended up being partnered by none other than David himself following his intended jockey being unable to take the ride after an injury a few days earlier that wasn’t realised until the last minute on the advice of the racecourse Doctor. David proved an able substitute however & steered Marquis Of Carabas into 2nd place. It’s great to see the horses back in good form & with more runners due out this week both NH & on the flat, hopefully we can find some more winning opportunities just around the corner.